From some rather simple beginnings in 1989 in the West End of Brisbane, the Coffee Club has grown to over 288 outlets in Australia, 35 in New Zealand, 3 in China, 2 in Egypt, 1 in New Caledonia and now 8 in Thailand with a further 20 planned over three years. Thailand got its first one in Phuket in 2009, followed shortly after by Pattaya in the Royal Garden Plaza. The sixth Thai one was Pattaya’s second on the Pattaya-Naklua Road (opposite Soi 18). The restaurant is actually in four sections. There is the outdoor, closest to the road, with no cover. Then retreating towards the inner sections there is the second exterior, but covered. 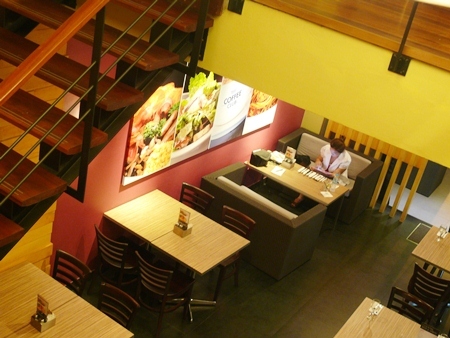 Go further into the restaurant and you enter the air-conditioned section, and then finally there is an upstairs area, air-conditioned, that can be used for private functions. The décor is elegantly simple and uncluttered. 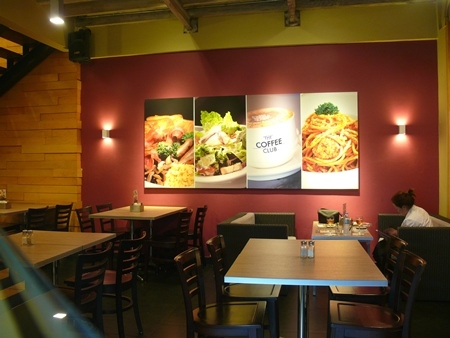 The coffee bar along one wall, the kitchen behind the back wall and comfortable modern style seating. We had come to review their new range of dishes, but before we did, we ordered two Treeline Chardonnays (B. 190 per glass), a pleasant Australian quaffer. They also have a Treeline Shiraz at the same price, though if you want to try a bottle, I can recommend the Peter Lehmann Cabernet Sauvignon Merlot at B. 970 per bottle, or the Duca Del Poggio Prosecco even cheaper at B. 900. The “ordinary” menu is not at all ordinary, and is a photographic one, with excellent photography, inviting the diner to wade in! The six pages begin with different coffees (as you would expect in a place called The Coffee Club), with nine on offer plus liqueur coffees. The second page has breakfasts (the restaurant opens at 6.30 a.m.) ranging from simple toast and jam, through three large omelets (three eggs) and most items under B. 200. Next up are starters, sides and salads, with Caesar, Garden, Greek and Asian chicken (B. 150-170), plus a range of extras you can add in to personalize your own salads, such as smoked salmon, grilled chicken, prawns and a lemon-pepper calamari. Next on offer are the gourmet sandwiches and open grilled sandwiches. These are presented on a thick Turkish bread (made from a wheat flour) and range between B. 160-230 (lean ham and Dijon mustard). Light meals include fish and chips, BLT and chips (all between B. 200-235) and then there is a Kid’s Club menu (B. 110-205) and has the perennial children’s favorites such as chicken nuggets, fish and chips and a grilled sausage sandwich and chips on the Turkish bread, which comes as a very large portion. There is a page of Thai food, generally under B. 150 and 11 different items to choose from. The final page has grills (B. 260-590) and pasta (B. 175-230). The meats are served with your choice of sauces including Hollandaise, mushroom or peppercorn and with vegetables or salad all included. However, we had come to try the four specials (which will run until June) and includes a pork chop (B. 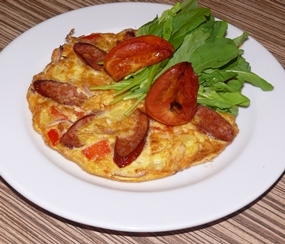 390), a Spanish omelet (B. 175), a duck breast (B. 225) and a barramundi (B. 490). The barra has a herb and ginger crust sitting in an Asian flavored broth, and was really superb, and in fact was Madame’s pick for the evening. The crispy noodle duck salad featured Peking style marinated duck breast with salad, bean sprouts and crispy noodles. Finally, my choice for the evening was the Spanish omelet with chorizo, capsicum and potato topped with a roasted balsamic tomato glaze. These four items were described by Madame as European food with a Thai taste. For me, I could only agree, but note that the spiciness was not overdone, and I describe them as very flavorsome. I am sure you will enjoy all of them. Highly recommended! 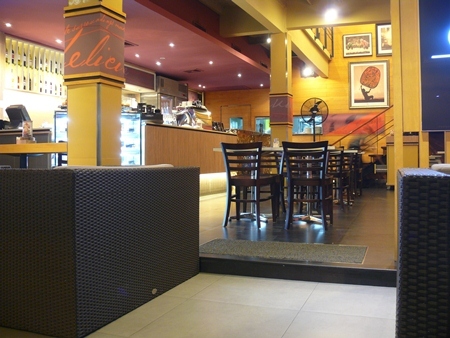 The Coffee Club (Naklua), Pattaya-Naklua Road, opposite Soi 18, open 6.30 a.m. until 11 p.m. seven days. Plenty of on-street parking. Telephone 038 371 162. Previous articleBring out the Mozzie!